Festoons of the eyelids are redundant folds of lax skin and orbicularis muscle of the upper or lower eyelids that hang, in hammocklike fashion, from canthus to canthus when the face is upright. Malar mounds are discrete soft tissue convexities that protrude from the lateral part of the malar eminence. They retain a relatively stable shape during usual facial movements, but can be worsened with smiling. Palpebral bags or baggy eyelids are also known as herniated intraorbital fat. They are the result of intraorbital fat bulging outward against an attenuated or weak orbital septum of the upper or lower eyelid. They are the most common aesthetic deficiency of the eyelids. These 3 variations of eyelid anatomy may be present in a minor degree at an early age, but they increase in severity as time passes and are generally associated with the appearance of aging. Each presents an aesthetic defect in a region that is the center of attention during face-to-face contact. The eyes and eyelids are the most potent vehicle of nonverbal communication. The subtlest movements of the eyelids are subjected to constant interpretation or misinterpretation. In a first impression, these eyelid features may cause one to underestimate the patient's vigor, enthusiasm, or friendliness. The image the patient sees in the mirror may lower his or her personal esteem. Skillful correction of these defects has the promise of removing an impediment to everyday social interaction. For expert viewpoints, information, and CME on aesthetic procedures, visit Medscape's Aesthetic Medicine Resource Center. Festoons of the eyelids had initially been dealt with as undescribed appendages to baggy eyelids. The anatomy of festoons was delineated, the types were classified, surgical strategies were developed, and the descriptive name was coined by the author in 1978. Malar mounds had also been noted over the years, but they had not been well defined anatomically and had not been given consistent or unambiguous names. The terms bags, pouches, and pads were used, but these terms were also used interchangeably for sagging or protruding skin of the cheek, perioral area, and elsewhere in the orbit. They are now termed malar bags, yet Castanares' original nomenclature included them as a component of baggy eyelids. A specific anatomic foundation for these structures was detailed, a morphological spectrum was described, and they were named malar mounds by the author in 1993. Substantial anatomic details were added by Pessa in 1997 and by Mendelson in 2001. Knowledge of the surgical anatomy and surgical correction of these entities continues to improve. Over time, predisposed individuals develop attenuation of the orbicularis oculi muscle and laxity of the attachments between the orbicularis and the deep fascia. The orbicularis progressively sags until folds of muscle are suspended across the lid, emulating gathered bunting. Some patients cite a history of familial occurrence of these folds. This phenomenon can affect any part of the upper or lower eyelid. However, the unmodified word festoon, without anatomic specification, has come to refer most often to sagging of the orbital and malar segments of the orbicularis oculi muscle of the lower eyelid. Commonly, protruding intraorbital fat and septum accompany festoons; however, occasionally, festoons are composed solely of muscle and skin. Corrective surgical steps are directed at tightening the slack muscle and skin. Occasionally, iatrogenic festoons occur. If skin with diminished elasticity is subjected to a temporomalar lift, the changes in the geometry and biomechanics of the advancing skin cause a redundancy that the inelastic structures may not be able to accommodate. Such festoons can be minimized by a concomitant or subsequent lower blepharoplasty, which incorporates carefully calculated skin or skin/muscle undermining and excision. The proclivity for induced festoon formation can be identified during the initial examination. This allows both the patient and the surgeon to be prepared. A malar mound is a discrete, stable prominence of skin and fat that bulges directly outward from the malar prominence. In younger patients, malar mounds are subtly delineated. Precursors of mounds are occasionally observed in children. In older patients, the mounds are more prominent. With aging, creases delineate the upper and lower borders of malar mounds. The creases form an acute angle, with the apex over the medial canthal area. The creases diverge as they pass over the malar eminence. Tracing laterally, the widening convexity of the mound fades into the convexity of the cheek, with only a suggestion of the furrow where the 2 convexities meet. Bags or pouches of the lower eyelids and heavy or hooded upper eyelids occur when intraorbital fat bulges forward against an attenuated orbital septum. Castanares' term herniated intraorbital fat indeed has merit. Palpebral bags are the most common aesthetic problem observed in eyelids, excluding laxity of the skin alone. A combined palpebral bag and festoon forms when bulging intraorbital fat protrudes into the muscular hammock. When the orbicularis oculi contracts, the fat is compressed into the orbit. Among patients who seek consultation for advanced aging changes of the eyelid-orbit area, an estimated one tenth have significant malar mounds and one twentieth have significant festoons. The incidence increases with the severity of aging changes. In virtually all of these patients, protruding intraorbital fat is part of the problem. Over time, the aging process of the periorbital area is marked by attenuation and atrophy of connective tissue structures, muscles, and skin, resulting in a multitude of undesirable changes. Some of these changes cause functional problems, some cause aesthetic problems, and some cause a combination of both. If skin and muscle are disproportionately affected, festoons occur. If the orbital septum is lax, protruding palpebral bags occur; in the presence of festoons, a combined palpebral bag/festoon results. If the pattern of fibrous-retaining elements in the malar area predisposes to malar mounds, these mounds become increasingly evident as time passes. Two steps in the clinical evaluation of festoons are the squinch test and the pinch test. If the patient with festoons forcibly contracts (squinches) the orbicularis oculi muscle, the laxity of the muscular component of the festoons is overcome and the muscle component is no longer obvious. Only the skin demonstrates persisting redundancy. Even protruding intraorbital fat disappears as the taut orbicularis forces it back into the orbit. As an aid in evaluation, the redundant skin of the festoon is grasped between the index finger and thumb and the laxity of the skin is judged with gentle traction; this is performed in both a relaxed state and with the orbicularis contracted. This pinch test is a means of judging the magnitude of the redundancy of skin and muscle as a unit before the orbicularis is contracted and a means of judging the laxity of the skin alone when the muscle is taut. In addition, if gentle lateral traction is similarly applied with the thumb and forefinger, passively tightening the festooned skin, the surgeon can judge the probable response to surgery and can gain insights for his or her surgical technique. If palpebral or malar festoons, mounds, or bags create an appreciable aesthetic defect in a psychologically and physically sound patient, surgical correction is a gratifying procedure for both patient and surgeon. If the connective tissue supporting structures of the lids is weak, lateral canthal support must be provided as part of the procedure. Evaluation should include a search for other problems associated with aging periorbital structures, such as involutional ptosis, senile ectropion, senile entropion, trichiasis, dry eye, or epiphora. A complete ophthalmologic examination is an important step, as is clearance by the patient's personal physician. The positions of the festoons are designated by the level of the affected orbicularis oculi, ie, (1) upper eyelid, (2) lower eyelid (pretarsal), (3) preseptal, (4) orbital, and (5) malar (see the image below). Sites of festoons include (A) upper lid, (B) pretarsal, (C) preseptal, (D) orbital, (E) malar, and (F) cutaneous dewlap (no muscle). Commonly, a festoon of the upper eyelid is formed from a single muscle fold composed of pretarsal, preseptal, and some orbital orbicularis fibers. Upper eyelid festoons hide the lid fold and burden the lashes with extra weight, often causing mechanical blepharoptosis and constriction of the upper and lateral visual fields. Some pendulous festoons sag beyond the eyelashes, obstructing the visual fields even more. Individual festoons of the lower eyelid may involve any single level or a combination of levels; all levels may sag in a cascade of festoons with overlapping folds. If the orbital septum is firm and the orbital fat does not bulge, the festoon may be composed of muscle and skin alone, without orbital fat. Occasionally, a dewlap of lax skin alone sags even lower than the muscle festoon. The pathologic anatomy of festoons can be observed in the operating room by elevating a skin flap to expose the anterior face of the lax bundles of orbicularis muscle. 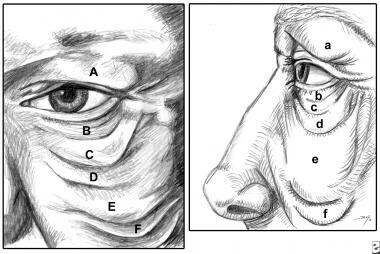 The author's current technique consists of exposing the anterior face of the orbicularis only minimally; therefore, demonstration of the pathologic anatomy of the festoon is no longer a routine part of the operation. Bear in mind that significant branches of the facial nerve pass near the deep surface of the orbicularis, particularly where the orbicularis overlaps the origin of the zygomaticus major. When the selected sector of muscle is excised, the deepest layer of orbicularis muscle fibers and the attached orbicularis fascia are kept intact to protect the vulnerable nerve branches. Malar mounds are pillowlike, somewhat triangular soft tissue convexities that project from the malar eminence. The upper border of the mound is outlined by a curving transverse fold or groove, the orbit-cheek fold, which delineates the structures of the orbit from those of the cheek. The inferior border of the mound is marked by the midcheek fold. This fold, or groove, separates the malar eminence and malar mound from the fat pad of the cheek and other soft tissues. Starting from the medial-canthal area, the midcheek fold crosses the cheek obliquely and downward, bisecting the cheek. These 2 folds diverge from medial to lateral (cheek eminence). They impart an underlying triangular configuration on the rounded malar mound. Malar mounds present a morphologic spectrum that ranges from a shadowy hint of a bulge to a large pendulous bag, sagging below the edge of the orbicularis, to an occasional medial blending with an even more saggy malar festoon. Fine connective tissue fibers anchored in the deep malar fascia travel outward through the suborbicularis fat, the orbicularis oculi muscle, and the subcutaneous fat and gain purchase in the deep dermis. Some appear to be fine telae subcutaneae. These fibers support and shape the malar mound. Pessa, in his anatomic study of the orbitomalar region, identified a specific connective tissue band, the malar septum, that delineates the inferomedial aspect of the malar mound. After orbital trauma, the malar septum arrests the migration of ecchymotic fluid beyond the orbital area, creating the typical pattern of a black eye. If upward traction is applied to the cheek and the temple, the malar mounds are flattened. Similarly, upward traction from a facial rhytidectomy may flatten a malar mound if the lift is substantial and the mound has been released from underlying connective tissue fibers. The orbicularis oculi and malar mounds are related anatomically. Peripheral fibers of the orbital portion of the orbicularis oculi traverse the base of the malar mound. Furrows, fenestrations, and defects often characterize the orbicularis fibers in the region of the muscle; even orphaned muscle segments isolated from the main muscle belly have been recorded. The associated malar fat is firmly attached to the outer face of the orbicularis. When the muscle-fat interface is separated, the surface of the fat shows finely lobulated ridges and nubbins that match the contour defects of the muscle. Where the muscle is fenestrated, fat penetrates the aperture and subcutaneous fat blends with the subjacent suborbicularis orbital fat. When only the cephalad portion of the mound is traversed by orbicularis, the fat in the remainder of the mound presents a confluence of subcutaneous and orbicularis fat. These may be incidental morphologic findings. Conversely, they may contribute to the shape or stability of the mounds—a point not determined at this time. The upper eyelid has 2 fat compartments, medial and central. The lower eyelid has 3, medial, central, and lateral. The medial compartments of the upper and lower lids contain pale-yellow fat with multiple complex lobules, which is continuous with the fat surrounding the ocular globe. The upper and lower medial fat pads appear to truly herniate through a small aperture in the orbital septum. The fat of the medial and lateral compartments has a deeper, richer yellow hue. The lobules of fat are larger, and most have simple ellipsoid or spherical shapes. The fat of this compartment is confined to the anterior orbit. The fat of the central compartment bulges forward against the septum rather than truly herniating. In the lower lid, the inferior oblique muscle separates the medial compartment from the central compartment. The central compartment of the upper lid has similar fat. The lateral compartment of the lower lid is small and is on a higher level than the central compartment. The character of the fat and the bulging configuration are similar. In the upper lid, the fat of the medial compartment extends well laterally but does not occupy a separate compartment. The lacrimal gland usually lies just posterior to this lateral extension of fat. A pathologic condition of the eyelids or orbital structures is a contraindication for blepharoplasty, but the patient's ophthalmologist may be able to overcome the problem with treatment or protective measures. Medical conditions that may jeopardize the patient's response to anesthesia or sedation or that may interfere with the patient's healing response are relative contraindications. The surgeon's sense that the patient has unrealistic expectations about the surgery, despite explanations, is a reason to hesitate and to proceed only if this issue is corrected. Muhlbauer W, Holm C. Orbital septorhaphy for the correction of baggy upper and lower eyelids. Aesthetic Plast Surg. 2000 Nov-Dec. 24(6):418-23. [Medline]. Castanares S. Classification of baggy eyelids deformity. Plast Reconstr Surg. 1977 May. 59(5):629-33. [Medline]. Okuda I, Irimoto M, Nakajima Y, Sakai S, Hirata K, Shirakabe Y. Using multidetector row computed tomography to evaluate baggy eyelid. Aesthetic Plast Surg. 2012 Apr. 36(2):290-4. [Medline]. [Full Text]. Pessa JE, Garza JR. The malar septum: The anatomic basis of malar mounds and malar edema. Aesthetic Surg J. 1997. 17:11-7. Mally P, Czyz CN, Wulc AE. The Role of Gravity in Periorbital and Midfacial Aging. Aesthet Surg J. 2014 May 30. 34 (6):809-822. [Medline]. Furnas DW. Festoons of orbicularis muscle as a cause of baggy eyelids. Plast Reconstr Surg. 1978 Apr. 61(4):540-6. [Medline]. Makhoul R, Noel W, Royer E, Szwebel J, Levan P. [Treatment of malar mounds by direct excision]. Ann Chir Plast Esthet. 2016 Apr. 61 (2):136-40. [Medline]. Core GB. Lateral access recontouring blepharoplasty for rejuvenation of the lower lids. Plast Reconstr Surg. 2013 Oct. 132(4):835-42. [Medline]. For split-level flaps, the outer face of the orbicularis is exposed by elevating a skin-only flap. The orbital septum and intraorbital fat are exposed by elevating a skin-muscle flap. Exposure of the orbicularis for myectomy. The skin flap is elevated. Exposure of orbital septum and fat for excision of excess intraorbital fat. The muscle flap is elevated. Segmental myectomy of orbicularis, subtotal thickness. The orbicularis fascia and strands of deep muscle fibers are left intact to protect the facial nerve branches. Pilot cut and skin excision. For the closure, deep layers of lateral wedge are closed with fine polydioxanone, Maxon, or nylon sutures, placing tension on the festoon. Festoons and dermatochalasia before blepharoplasty with segmental myectomies. After blepharoplasty with segmental myectomies for festoons and dermatochalasia.